I started publishing print-on-demand puzzle books a few months ago, and I’m now up to 22 books. Yay! 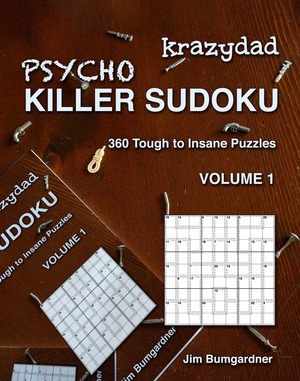 The latest are four volumes of Killer Sudoku, available in Large Print and 4-per-page. The most popular, at the moment, are the “Tough Kakuro” and the “Stupendous Suguru” books. The easiest way to find my books is to search for “Krazydad” on Amazon. If you think I’m getting rich from my burgeoning publishing empire, you would be wrong! I make a few dollars per book, and I’m selling about a book a day, which is keeping me in coffee, but not exactly paying for my dog’s chiropractor. If you’d like to help me work my way up to TWO cups of coffee, you can help by reviewing my books (honestly) after you buy them. Thanks! The print-on-demand company I’m using is CreateSpace which is owned by Amazon. There are rumors that CreateSpace might get merged into Amazon’s very similar KDP (Kindle Direct Publishing) service. If/when this happens, it may affect the availability of my books for a short time, but they should reappear. My reason for not initially publishing on KDP is that it requires that the book be made available in digital form for the Kindle. Since my books require pencils/pens, they need to be on paper, not Kindles. I wouldn’t want Kindle owners buying virtual versions of my books only to be disappointed, and leaving bad reviews. If you’re curious how this whole self-publishing thing works, and want more gory details, I’m happy to share – just contact me via email. This entry was posted on Thursday, February 22nd, 2018 at 5:10 pm	and is filed under Linkydinks. You can follow any responses to this entry through the RSS 2.0 feed. Both comments and pings are currently closed.